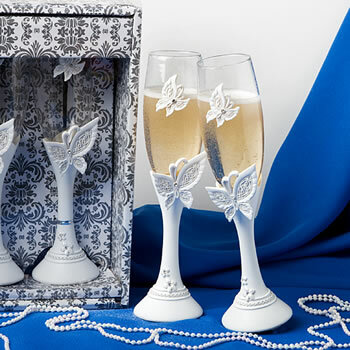 These butterfly champagne flutes arrived soon after ordered. They are very beautiful & we can't wait to use them during our June wedding. We are in our 60's and each a second marriage. We're doing it up right! Including butterflies in our wedding decor. These flutes are extra special & will add the right elegance to our special day. These are nice for the price; however, one of my flutes had yellow glue around one of the butterfly studs. It was very noticeable against the pure white of glasses. I'm not sure why it was there nor why the manufacturer didn't catch it before shipping it. It would have been more costly to returned the flutes and hope the replacements were not in the same condition than to just keep the "unsightly" pair.